Focus for this session: With the aid of our crystals, we will allow a state of deep peace and receptivity to enfold us. Together we will employ: breathing techniques, chanting and guided shamanic journey to approach the state of samavesha. Samavesha is a sanskrit word which roughly translates as entering together. Sama: quiet, emancipation from all the illusions of existence; equanimity; tranquility. Avesa: entrance into; immersion. It is going into the silence. Our goal is to reach a level of entranced meditation which allows us to perceive Truth directly for ourselves. The fruit? An intoxicating, self-empowered awareness. I will walk us through relaxation and trance induction using Nadi Shuddhi & lingering breath, guided visualization, as well as sacred oils and a shamanic track. As always, our high vibrational crystals will help us with attunement. To prepare: In the days leading up to this meetup, please ask a key question before going to bed. What do you wish to know? Keep a journal and pen by your bedside to write your dreams down when you awake. Then, at our meetup, you can journey for further insight. Bring your journal and a pen. To allow for a deeper trance, you may want to avoid eating anything heavy Saturday morning. Have you wanted to join us but just don't live locally? I'm happy to announce my monthly live stream-- We'll chant in unison and meditate for 1 hour, enjoying my special rose tea before and after. Women chanting together in circle is a very powerful and ancient practice. It helps to raise our kundalini-- the serpent goddess within us which governs intuition and enlightenment. Chanting after drinking rose tea allows us to raise our personal frequencies so that we may enjoy greater peace, increased intuition and alignment with divine purpose. Rose is associated with venus, luxury, and wealth. Its oil is known to be the highest frequency oil available to us. Self-love and beauty naturally helps us to rise in frequency, as we instinctively choose only the best associations, the best foods to ingest, and the highest quality of experiences to enjoy. Get my Tea & Mantras sachet mailed to you every month plus access to my chanting live stream. Your sachet will contain 1 high-vibrational crystal and my specially prepared rose tea so we can make use of them together during the live stream. 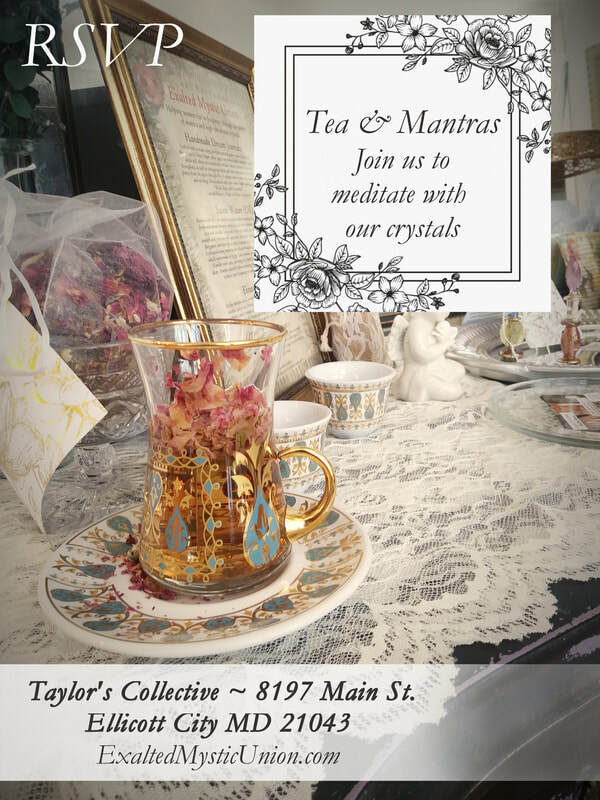 Join us at Taylor's Collective for tea and chanting surrounded by elegant vintage decor, fine jewelry and art. Taylor's Collective is an art/antique gallery in which Exalted Mystic Union shares a retail space with Jeweling Grace. 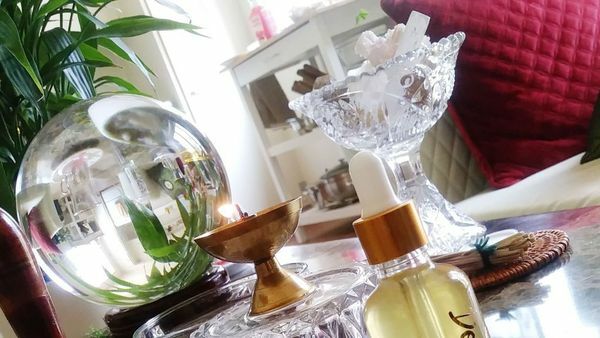 ​We gather here once per month to meditate with our crystals, with an added emphasis on self-love to evoke our divine feminine. At each Tea & Mantras gathering, we will drink tea, chant mystic mantras and enjoy the high-vibrational melodies of a crystal singing bowl. This event is not open to the general public, as it will require a ticket. This allows me to better serve each participant and provide refreshments while keeping it intimate. Each attendee will receive a small high-vibrational crystal to keep. Note, we will be sitting bohemian style around an ottoman. Floor pillows will be provided. Meditating with Crystals: The aim is to enjoy an attunement to your high vibrational crystals and to your own highest wisdom through mantra recitation. Mantras allow us to raise our personal frequencies. When we maintain a higher vibration, it is easier to perceive guidance from our crystals, from our highest guides, and from our intuitional core. **Don't forget to bring a high vibrational crystal with you. As mentioned, you will receive a high vibrational crystal to keep so no worries if you don't already have one. Examples: Selenite, Danburite, Elestial Quartz, Moldavite, Sodalite, Phantom Quartz, Spirit Quartz, Himalayan Nirvana Quartz, Fenster Quartz, etc.